Several readers and friends have asked recently, so I thought I’d share a list of the resources that have been most helpful to me in understanding hypothyroidism. First, here’s a very brief synopsis of my experience with hypothyroidism. After three miscarriages, I was diagnosed with “barely clinical” hypothyroidism and given standard thyroid meds. Later came a Hashimoto’s diagnosis by an endocrinologist–and a slightly altered treatment–but I still wasn’t feeling well. Finally, I decided to do some research of my own instead of merely relying on what I’d been told. Since my symptoms weren’t going away, even with the medication, I needed some coping strategies. Everything I read seemed to share a common thread: Eliminating gluten from the diet seems to help with thyroid disease (and all autoimmune diseases). My research led me to a new holistic M.D., who evaluated my whole situation, as opposed to only my thyroid function. He recommended major dietary changes, as well as a different brand of thyroid medication and a host of natural supplements. There are still ups and downs, and I continue to read and learn more, tweaking my lifestyle as I go. But the bottom line is this: I’m feeling better than I’ve felt in years. And I have a much better grasp of true health, as opposed to a mere absence of symptoms. Are you looking for answers to thyroid-related questions? Read on. These are the books I read first, and then along the way, plus a few I’d still like to read. At the end of the post, I’ll share a fantastic new online resource. This was the very first book I read, the book that launched my entire journey into wellness and holistic health. Mary J. Shomon is somewhat of a thyroid disease celebrity, if there is such a thing. I could not believe there was a book with my exact question as its title! 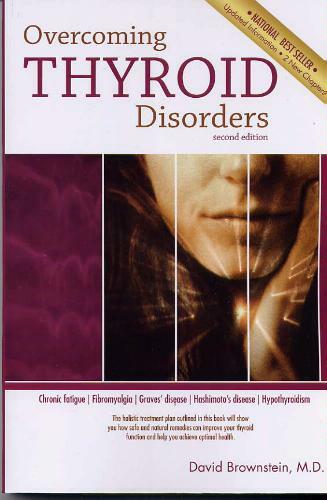 As I recall, this book helped me understand the underlying causes of hypothyroidism, as opposed to merely treating the effects of the disease. I read this title more recently, and found it helpful and concise. It was recommended by my holistic doctor. And by the way, David Brownstein has authored quite a few titles on a variety of health topics. I’m currently reading Salt Your Way To Health . I’ve read bits and pieces of this book, which has good reviews on Amazon. Mary J. Shomon–author of the first book listed above, as well as the book mentioned below–wrote the forward. The author is both an M.D. and a Ph.D.
Another title by Mary J. Shomon, this is the revised edition of her 2004 New York Times Bestseller. Recently, I came across a great review for Hashimoto’s Thyroiditis: Lifestyle Interventions for Finding and Treating the Root Cause , which led me to the author’s website and Facebook page. Having just discovered her resources, I’m still a bit overwhelmed by the sheer volume of info on her sites, but I’m slowly digging in and am so encouraged to have found her. So there you have my Top 6 Resources for Hypothyroidism. If you are–or someone you love is–struggling with a thyroid disease, or even the suspicion of an undiagnosed thyroid disease, I hope these books and websites will provide the answers and the hope that you need. Do you know of other helpful resources for dealing with thyroid disease? I’d love to hear about them. I actually have Mary J. Shomon’s Living Well with Hypothyroidism book on my bedside table. It is a good read and I can relate to a lot of the case studies about people with under active thyroid gland in the book. Her book was so helpful to me, too. I, too, am hypo. Would love to know what you do to treat yours. I’ve taken meds for years (and years!) – they mostly keep it under control, but not always. About once/twice a year things go really crazy and I feel really awful…….and I frequently don’t feel great. I’ve just started using doTERRA oils and have been researching how they can help. I am anxious to see if our library carries any of the books you recommend. Thanks for sharing!